Happy Friday everyone! This first week of school went by so quickly and for N's lunch today I hand-cut a school bus sandwich even though N travels to and from school by car. I was inspired by Jill from Kitchenfunwithmy3sons who makes super cute and fun foods. Have a great weekend. Beep!Beep! 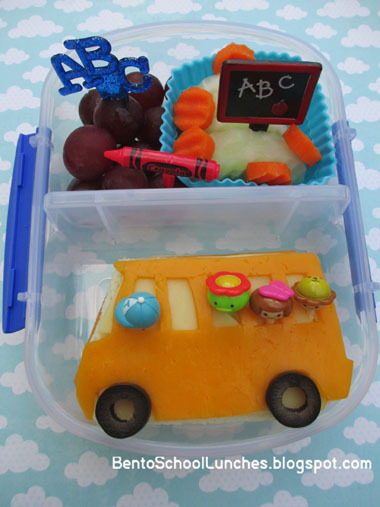 In this bento: The top section contains seedless grapes, crinkle cut cucumber slices and carrots. The bottom section contains a school bus shaped sandwich topped with smoked gouda and colby cheese. Tires are made from sliced large ripe olives. Packed in Sistema lunchbox. Love your school bus! Very clever!! Aww..i love the school bus too! Well done, Rina! I love the school bus! I am in love with this lunch! I love how you put the little people on the bus. That makes me want the little people! That is the cutest school bus! I need to save your ideas for my little boy's first day of Kinder Tuesday. So, so cute! Very cute. Great little bus. The bus looks so perfect Rina! I tried making one, but it was a really ugly bus! (Lol) I couldn't even bear to take a close up picture! You make your bus look effort-less and wonderful! Love it! Berrygirl, I have never seen any ugly bentos from you before and I am sure it looks just fine! I don't make cute bentos all the time but I still take pix of them and sometimes bad pic too,lol. I am glad that I made sense and always remember that you are a Wonderful Mom! !